In the Northeast, Rosehips are ripe for picking in late August found mostly along sandy beaches and dunes. They arrive just in time for the back-to-school, cooler fall weather which brings runny noses and colds. THESE BEAUTIFUL RED GLOBES BOOST THE IMMUNE SYSTEM AND CONTAIN 20-30% MORE VITAMIN C THAN ORANGES! 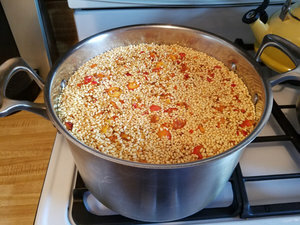 I have used this rosehip recipe for many years and each year I have to make more and more as friends now ask for it to help with the cold and flu season! This recipe is in 'parts' because it depends on how many Rosehips you pick. 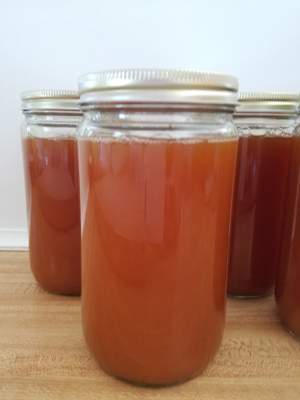 The measurments do not have to be exact to make a delicious, healthy Rosehip syrup! 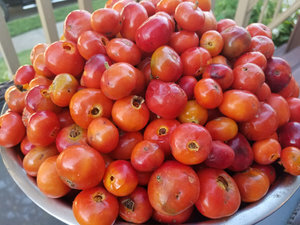 Clean rosehips thoroughly by removing stems and leaves and running under water. Chop rosehips in food processor until they're mashed up and immediately add them to the pot with water (cover rosehips completely). While simmering, use a slotted spoon to remove the seeds that float to the top. Pour rosehips and liquid into a mesh strainer to strain out the liquid. Allow the rosehip liquid to drip through then gently press to extract as much liquid as possible. Put the starined rosehips back into the pot and add more water, repeat steps 4-7. Combine both rosehip liquid extractions in a pot. Warm and add sweetener and cinnamon (plus any other spices you'd like) to dissolve. Taste and adjust sweetness and spices. Pour rosehip syrup into hot, sterilized jars. Let sit for 15 minutes, then cover jar. Label each jar with the the name of the syrup, date, and ingredients. Once a jar is opened, store it in the refrigerator.